My review of Rounder 1726, Caribbean Voyage Saraca Funerary Music of Carriacou, is on this site, and describes the importance of funeral and other death-related rituals and music to the people of Carriacou. Carriacou is a small and impoverished community, largely sustained, since the abolition of slavery, by the proceeds of migrant labour, and the collective wisdom of experience, embodied in the relationship of the living to the Old Parents, has been an important element in developing and sustaining ways to survive against the odds. Constant awareness that the past is immanent in the present has also meant that Carriacouans have retained a knowledge of individual regional and ethnic African identities, which are embodied in the different Nation dances and rhythms that are part of the Big Drum music, alongside the Creole and ‘frivolous’ rhythms, which have African elements, but were created in the Caribbean. The Tombstone Feast is the final part of the rites associated with death and burial, and takes place when the grave of the departed is marked by the placing of a stone. As described in the review of Rounder 1726, until this can be done (which is dependent on funds being available, and the ability of those involved to travel home for the occasion), the memory of the dead person must be honoured each year, by a mass, prayer meeting or Big Drum. (Which of these is required is often specified by the deceased in a dream visitation, and if the commemoration is not carried out, a Beg Pardon [forgiveness ritual] will be necessary.) Once the stone is set, however, the spirit will rest comfortably. The Tombstone Feast is thus an important ritual it maintains respect for the ancestors and the Old Parents, it unites and reunites the generations, and it brings Carriacouans who have emigrated back home to friends and relatives left behind. 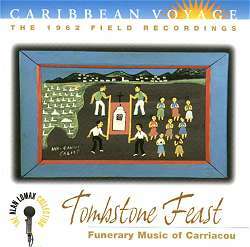 The recordings on this CD were made in 1962; by 1971, when Donald Hill did his fieldwork, on which the notes are largely based, the Tombstone Feast had become shorter (one day rather than two), less elaborate and, one feels, somewhat dislodged from its position as one of the bulwarks of Carriacouan society. In 1962, the tombstone was carried from the house to the grave on poles ‘which they rested from time to time on chairs which they also carried. By 1971, the stone was usually placed unceremoniously in the trunk of a taxi and driven to a location near the grave site, whence it was carried to the grave on poles in the traditional manner.’ No doubt this process of cultural erosion has continued in the succeeding 30 years, as Carriacou has become more open to the outside world. In 1962, the Big Drum dances would take place in the yard of the dead person’s home, after the placing of the tombstone, and ran from about 4 p.m. until dawn the next day. Over the night of August 1-2, 1962, Alan Lomax and his tape recorder were present at a Tombstone Feast in L’Esterre, and recordings from that event, all of them unissued until now, comprise this CD. All music is culturally embedded, and experiencing traditional music from outside, as disembodied, reproduced sound, without the matrix of associations and meanings available to the participants, is always an incomplete experience. (Believe me, a CD by a Shetland dance band doesn’t convey the experience of a Shetland dance.) The Big Drum music of Carriacou carries a huge freight of tradition, history and social meaning, but even such a simple aspect as being unable to see the dances that the music is played for constitutes a major barrier to one’s understanding of the processes and systems involved. (The dancer ‘conduct[s the cut drummer’s] statements with her danced rhythms [and] dictates the end of the song by touching the head of the cut drum with the hem of her skirt.’) The drinking of jack rum, the ritual sharing of food, the ‘wetting’ (libation) of the dance area with whiskey, rice and water, the story telling, the opportunities for youngsters to flirt discreetly - all these are present in the Tombstone Feast, but absent from our experience of it. To some extent, the booklet’s excellent words and pictures can make up for these absences, but in the end, it’s the splendour of the music itself which signals the richness of the cultural matrix which formed it, and which it has formed in turn. Music is always much more than the noise it makes, but the noise this music makes is truly wonderful.